I'm considering acquiring a few turkey hens and was wondering can you eat Turkey eggs? Has anyone eaten one? How do they taste? Yes, you absolutely can eat turkey eggs. They are somewhat like duck eggs in that they are richer and creamier in taste. However, turkeys don't lay nearly as many eggs as chickens - perhaps 100 a year as opposed to a hen's 300, so don't expect to enjoy them too often. Turkey eggs look and taste like chicken eggs, they are just bigger. The ones I have tried had a higher yolk to white ratio, and were much richer as a result. Perfectly safe to eat. 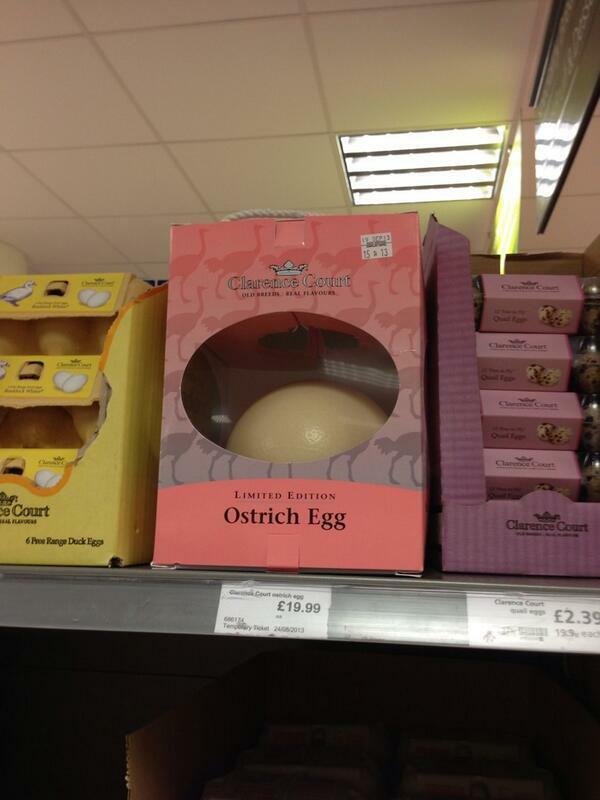 Yes, and here's a rare example of some on sale in a supermarket, in the "eggs" section. 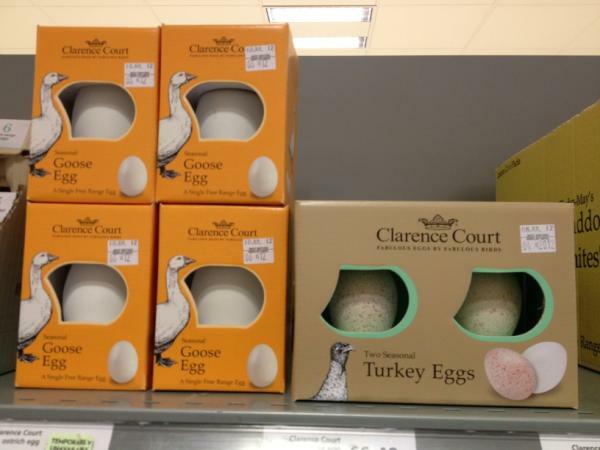 These images are taken from the Buzzfeed article "19 Times Waitrose Went Way, Way Too Far", which gently makes fun of a UK supermarket chain that has a reputation for being rather posh. Individual Twitter users are credited in that article. For a size comparison, you can just make out a box of hen's eggs on the left. Yes - they are even commercially available now. In fact, almost all bird eggs are edible. Only a few birds have any kind of poison, and they live in Indonesia. This source gives more details about the two kinds of birds that are known to be toxic, and the nutritional benefits of eating eggs. However, given the difficulty of obtaining eggs from large hens and finding the nests of smaller birds, they are not often described in survival or wildlife guides. Not the answer you're looking for? Browse other questions tagged eggs turkey or ask your own question.